OVER 300 WILD mammal species in Asia, Africa and Latin America are being driven to extinction by humanity’s voracious appetite for bushmeat, according to a new global assessment released today. The species at risk range from rats to rhinoceros, and include docile, ant-eating pangolins as well as flesh-ripping big cats and large primates. The findings, published today in the journal Royal Society Open Science, are evidence of a “global crisis” for warm-blooded land animals, 15 top conservation scientists concluded. Terrestrial mammals are experiencing a massive collapse in their population sizes and geographical ranges around the world. This decline, it said, was part of a larger trend known as a “mass extinction event,” only the sixth time in half a billion years that Earth’s species are dying out at more than 1,000 times the usual rate. According to the Union for the Conservation of Nature’s (IUCN) Red List of endangered species, a quarter of 4,556 land mammals assessed are on the road to annihilation. 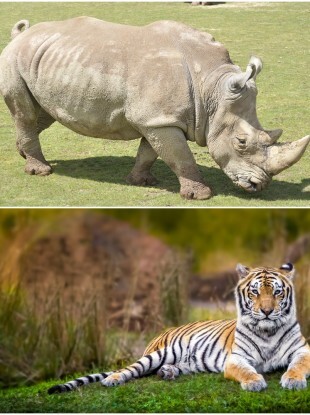 For 301 of these threatened species, “hunting by humans” – mainly for food, but also as purported health and virility boosters, and trophies such as horns or pelts – is the main threat, according to the comprehensive review of scientific literature. The scale of the problem is daunting: some 89,000 tonnes of wild meat – with a market value of about $200 million (€180 million) – is butchered every year from the Brazilian Amazon alone, the study found. Forty of these species were already classed as critically endangered by 1996, indicating that there has been little or no conservation progress in reversing their fate. “Through cascading effects, the loss of these mammals is altering the structure and function of the environments in which they occur,” the study notes. The research echoed a recent study which showed that more than two-thirds of 9,000 threatened species – including plants, birds and insects – faced over-exploitation from commerce, recreation or subsistence. Giving local communities stronger land rights – so that they have a more direct interest in conservation – is also key, they said. Email “Humans are hunting 300 mammal species to the brink of extinction for meat, says new global report”. Feedback on “Humans are hunting 300 mammal species to the brink of extinction for meat, says new global report”.